Mounting a VHF radio has never been easier. The Explorer GX1600 has an ultra thin, compact rear case, only 3.5” in depth or half the depth of comparable VHF radios on the market. The rear case design also gives flexibility when flush mounting the radio in tight areas or bracket mounting the radio by taking up less dash space, and allowing more mounting options. 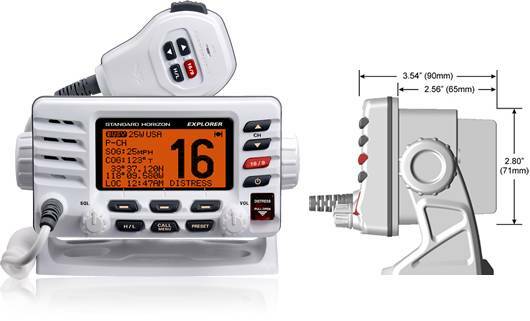 The EXPLORER is an ITU-R M493 Class D class VHF with a separate Channel 70 receiver, which allows DSC calls to be received even when listening to communications. Need to remotely control the VHF from your cockpit of fly bridge? The EXPLORER is RAM3+ remote mic capable to control all VHF, DSC functions at a second station. Scanning is not an issue with the EXPLORER. The radio can be setup to scan any number of channels with or without a Channel 16 as the priority channel or simply can be setup to scan between a priority channel and one other channel (dual watch). The EXPLORER features Clear Voice Noise Reduction Technology eliminating unwanted background noises like engines and wind during transmission. This assures transmissions are crystal clear along with dedicated 16/9, H/L keys and channel selection. The EXPLORER is capable of entering and saving up to 100 waypoints. These waypoints may be selected and navigated to by using a unique navigation compass display that shows your vessels SOG, COG, BRG (Bearing) and DST (Distance) to the waypoint when connected to an external GPS. In addition, the EXPLORER may be setup to automatically poll the GPS position of up to 4 stations. The Explorer is supplied from the factory preloaded with description of the use of Marine channels (16-Distress, 22A-USCG, 71-Pleasure...). The channel names may be customized by the user to easily understand the use of each channel. By connecting a GPS to the EXPLORER; Position, date, and time are also displayed when interfaced with a GPS receiver. 10 NOAA and Canadian Weather channels are pre-programmed and easily selectable using the dedicated WX key. In addition, the EXPLORER can be set to monitor WX channels and provide an audible alert to inform of pending storm advisories. If the EXPLORER fails for any reason (including water damage) during normal use for the first 3 years of ownership, STANDARD HORIZON will repair or replace it free, without hassles or charges. If it fails for anytime thereafter in normal use, for as long as the original purchaser owns the radio, STANDARD Horizon's Lifetime Flat Rate and Customer Loyalty Service Programs will cover it.